There’s no team on the schedule Estill’s girls should be more familiar with than Model. That could bode well when the Lady Engineers host the Lady Patriots in their next outing on Jan. 2. Coach Mark McKinley’s squad opened the season with a win at Model, but dropped a one-point heart-breaker to the Richmond school Monday evening in the Berea Holiday Classic. After opening 2-0, Estill had dropped five straight, but appeared ready to get back on the winning track, taking a 9-0 lead early on. With junior Chelsea Alexander displaying pin-point accuracy from the three-point line, Estill was on top 11-5 after the first quarter. The second frame, however, the Lady Engineers went cold, finding themselves outscored 11-3 and trailing 16-14 at the half. The team played on even terms in the second half, but Estill committed a turnover in the game’s closing seconds, ending a chance to claim victory. Alexander was the only Lady Engineer in double-figure scoring with 17, followed by Cassidy Flynn with 7; Selena Neal, 5; Candace Gould and Chelsea Honchell, 4 each; and Randi Risen, 2. 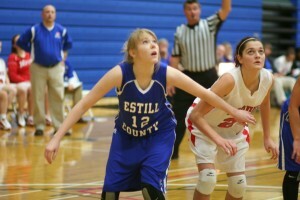 Estill had fallen to Greenwood, 65-45 and to Elliott County, 51-41, in earlier rounds of the four-day tourney. Last week, Owsley County prevailed 55-35 in a game played at Booneville.